The Nomad 880 is designed to assist glaziers to unload, transport and install glass safely. It has a lifting capacity of 400 Kg's (880 Lbs). It can rotate glass measuring up to 4400 mm (180"). It has adjustments to allow for side and top pocket glazing. The Mule 660 is designed to assist glass workers to unload, rotate and transport large plates of glass in shop. It has a lifting capacity of 300 Kg's (660 Lbs). It can rotate glass measuring upto 4400 mm (180"). The Mule has a 12 volt battery powered vacuum pump. The Glassboy 770/1100 is a below-the-hook vacuum lifter that is a reliable, efficient and safe method of handling nearly any smooth, nonporous material, including glass, metal, stone, plastics and laminates. Supports up to 50 Kg's (110 Lbs), Ideal for one man to carry glass, Reduces upper limb injuries, Adjusts to different body shapes, Easy to put on and remove, Comfortable shoulder straps, Easy release front safety buckle. 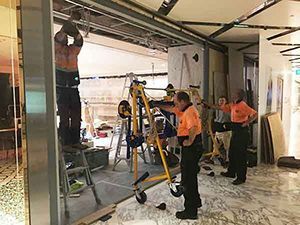 “Having only a booklet and dvd to watch and understand how the Nomad works, our staff, of my self and two apprentices had this machine figured out in a matter of hours. “Just wanted to give you some feedback on the lifter we purchased a couple of months ago. So far we’ve completed 3 installations. “The Quattrolifts Nomad is a fantastic piece of equipment for maneuvering glass. It is everything that it was promoted to be and even more. We are able to handle larger sheets of glass with fewer people much more safely. It has been invaluable for installations, reducing our time significantly.